2016 Waxwing Wine Cellars, Syrah, Flocchini Vineyard, Petaluma Gap AVA, Sonoma County. 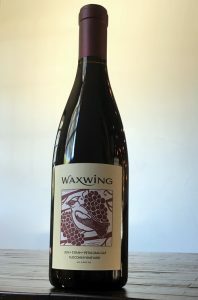 Another small batch beauty from Scott Sisemore of Waxwing Wine Cellars, the Petaluma Gap Flocchini Vineyard Syrah shows an open-knit ripe character with opulent California fruit purity and a nicely balanced lower alcohol style. Sisemore has been sourcing from this site for about five vintages now, with promising results and this 2016 is the best effort to date, the Flocchini family had traditionally run dairy cows on the property, but planted a portion of their property to grapes in 2002, including some blocks of Syrah with clones that include Noir and 877. Once part of the greater Sonoma Coast appellation , the Flocchini is now part of the new Petaluma Gap AVA (growing region) which is fast becoming known for producing balanced, delicious cool climate Syrah as well as a classic area for rich and deeply flavored Pinot Noir. The vineyard is located along Old Lakeville Road southeast of the old town of Petaluma, and the section Scott takes is on a gentle west facing slope above the Petaluma River with great afternoon sun exposure and cool breezes making for a longer growing season that helps with concentration and complex flavors. The dark and almost opaque Flocchini Syrah by Waxwing shows dense layers of fruit with blackberry, raspberry, plum and thick cherry compote along with black fig, wild flowers, sweet oak notes and light spices, it’s beautifully textured and rich in body with refined tannins that makes for a serious and forward wine to be enjoyed even now and for the next five years.